It's a good thing that Father's Day is still over a month away. Still have plenty of time to track down a much better present than this creepy trophy. 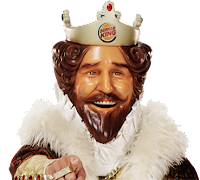 The father, king for the day, on this #1 Dad award looks eerily like a golden mini version of the Burger King. Don't wish such horrors on your Dad.